A passerby on a Georgia street captured a sweet moment between a young boy and an elderly woman -- both strangers -- in a cellphone video now going viral. 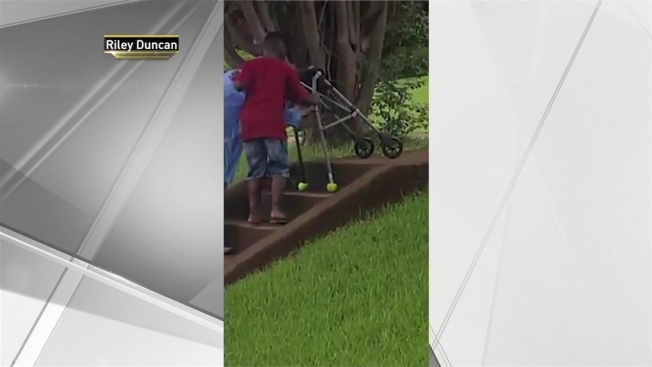 Maurice Adams Jr., 8, is seen in a Facebook video helping an elderly woman using a walker up a set of stairs. He was in the car with his mother when he saw her struggling to cross the busy road by herself, and he asked if he could go help her up the stairs, according to CNN. Riley Duncan, who didn't know Maurice or his mother, was in the car behind them. He saw Maurice and started recording the random act of kindness. When the two reached the top of the stairs, the woman gave Maurice a hug. Duncan got in contact with Maurice and his mother not long after posting the video on Facebook. They met up on Wednesday, and Duncan said he told Maurice he did an "awesome job." Duncan also rewarded him with $100 for his act of kindness.